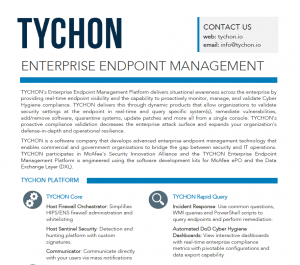 TYCHON’s Enterprise Endpoint Management Platform delivers situational awareness across the enterprise by providing real-time endpoint visibility and the capability to proactively monitor, manage, and validate Cyber Hygiene compliance. TYCHON delivers this through dynamic products that allow organizations to validate security settings at the endpoint in real-time and query specific system(s), remediate vulnerabilities, add/remove software, quarantine systems, update patches and more all from a single console. TYCHON’s proactive compliance validation decreases the enterprise attack surface and expands your organization’s defense-in-depth and operational resilience. Host Sentinel Security: Detection and hunting platform with custom signatures. Incident Response: Use common questions, WMI queries and PowerShell scripts to query endpoints and perform remediation. Continuously monitor endpoint and server activity for instant identification of threats and complete view of an incident, root cause analysis, and tracing of network propagation. An optional data ingestion engine for endpoint information. Use it to receive all endpoint data from DXL brokers and unburden the ePO from endpoint DXL traffic.